The What Hi-Fi? 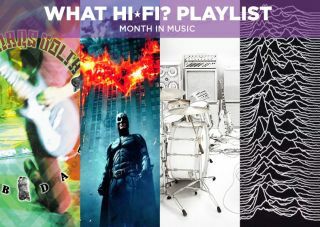 month in music - April 2017 | What Hi-Fi? As much as David Bowie, Nina Simone and every Hans Zimmer soundtrack have become staple listening material at What Hi-Fi? towers, we're always eager to discover, or rediscover, new and old music – an easy feat nowadays thanks in no small part to music streaming services. Every month, we’ll be figuratively opening our test room doors to share what we've been listening to, and the new releases we're looking forward to hearing. I remember thinking Secret Machines were a bloody good idea at the time. Now Here Is Nowhere was the Dallas three-piece’s debut album (coming a leisurely two years after the September 000 EP, their only previous release) and it bolted together some very agreeable influences. Some Krautrock relentlessness, some Led Zep drive in the engine-room, some Pink Floyd spaciousness and dislocation, some (always and endlessly unfashionable) shoegazing atonality. It all fitted together to make a kind of wan, druggy Texan Frankenstein’s Monster. Now Here Is Nowhere is the sound of a band as much in love with the possibilities of sound – its colours and textures, its ability to soothe and to unsettle – as with the possibilities of songs. There are some strong melodic moments on this album (You Are Chains in particular) and no band with so stentorian a rhythm section could ever be devoid of structure, but melody and structure play a definite second fiddle to the sprawl of First Wave Intact or the title track. Listen to Sad And Lonely: It’s built a bit like a pop song, but the tones and textures, the dynamics and the sheer attack all indicate where Secret Machines’ priorities lay. I saw Secret Machines perform in Brighton in 2006, touring the disappointing follow-up album Ten Silver Drops. They were pretty good: loud, together, not much to look at but quite an intimidating sonic proposition. And after that I pretty much forgot about them. And then last week I was reading about Run Out Groove on this very website – it’s a boutique label (as boutique as anything owned by Warner Music can be, anyway) that lets its customers have a say in the records it releases. “The current record available for pre-order is Secret Machines’ Now Here Is Nowhere”, it said. Which is what made me dig out my copy and stick it on the turntable. And it still sounds immense. This live record encapsulates all that is glorious about The Mars Volta. Recorded between 2003 and 2005 when the band were touring their first two albums – Deloused in the Comatorium and Frances the Mute – Scabdates acts as a courier, sitting creatively, if not chronologically, between the two. It’s almost Deloused in the style of Frances, dousing their earlier works, which were more in the mould of Omar Rodríguez-López and Cedric Bixler-Zavala's previous band At The Drive-In, with extended instrumentals and improvisation. To that end, there are only really three of the band’s songs represented on Scabdates: 26 minutes of studio recordings turned into an hour-and-a-quarter live album. It delicately treads the line between artistic experimentation and self-indulgence. There’s glory too, in guitarist Rodríguez-López’s light fingers while producing the record, forgoing tampering with overdubs to faithfully capture the energy that set these shows apart from the band's contemporaries. The inclusion of sound-check snippets and field recordings from their tour bus, however, elevates the concept of Scabdates beyond so many other live albums. Even I accept that this is a band whose material can act as a boundary between tastes, but the musicianship is unquestionable. That’s part of why it, along with the rest of The Mars Volta catalogue (but with the added value of being a live recording), is such a great barometer for testing hi-fi. Rodríguez-López is rightfully regarded widely among this generation's most creative and virtuoso guitarists; Jon Theodore directs changes in tempo and time signature with an astounding blend of precision and groove and Isiah Owens was undoubtedly one of contemporary music’s most iconic keyboard players before his untimely death. If any component in a system fails to pull its weight, this kind of sonic intricacy will shine a particularly unforgiving light upon it. Most pertinently, though, I’ve yet to hear another live record like Scabdates. Beware of thrashing images! This should be the warning on any of Joy Division's live set videos. Only recently have I come to be enlightened about Curtis’ infamous “moves” and I cannot believe I hadn't seen them before. There is no denying that he didn’t give it his all. How much of it was being in the moment or from other factors we will never know, but what I do know is that I should have discovered this album earlier. Despite only being around for four years, the solemn sound of Curtis and his fellow bandmates influenced millions and still continues to do so today. Unknown Pleasures' mix of keyboard, bass, guitar and drums provides a good range of ups and downs similar to the mood of the band. Beware you catch yourself nodding along to the smooth, uplifting sound of the guitar only to come crashing back down with the deep vocals of Curtis and the clang of the cymbals. The unpredictability of the sound could be the reason why it’s such a crowd-pleaser. It could be said that the Arctic Monkeys have an uncanny resemblance to Joy Division. A prime example being Joy Division's She’s Lost Control and Arctic Monkeys I Wanna Be Yours. For a step back in time to your post-Punk/Indie roots, or just for a sing-a-long and causal foot tap to Love Will Tear Us Apart, Division comes highly recommended. If you knew of Unknown Pleasures then have another listen and refresh yourself of how to be mardy but keep an upbeat backing track. It might take the edge off your commute home. Readers will know that we’ve used this album regularly for the best part of a decade and rightly so. Even now there’s little around that can match the complexity, dynamic excesses and sheer thrill of listening to this soundtrack in full flow. If you’re looking for highlights we love Like A Dog Chasing Cars, Harvey Two-Face, Watch The World Burn and the title track. It really helps when you’ve seen the film. And maybe that’s my problem with it. I know many traditional Classical music fans don’t have much regard for film soundtracks and I fully understand why. They're meant to accompany a picture on a screen, and so the music is there to embellish the visual experience rather than stand on its own. There’s certainly elements of that here with some of the tracks not quite feeling fully formed in their own right. Some of the music also reminds me of Holst’s Mars a little too obviously, but I like it all the same. This will never be regarded as a great classical music album in the sense that something by Stravinsky or Beethoven might. It’s the Papa Johns of the classical music world. Not quite the real thing but tasty all the same. A guilty pleasure? I think so. There are few artists as influential as Robert Hood when it comes to techno music. One of the original Detroit producers, a member of the unrivalled Underground Resistance collective, and a founding father of the minimal sound, Hood has enjoyed a fresh surge in popularity in recent years. An increase in output has taken him back to the top table of electronic producers, and his forthcoming album is set to be one of the biggest releases in underground dance music this year. Set for release on Dekmantel, the equally in vogue Amsterdam dance music label, if the material teased so far is anything to go by, we can expect no-nonsense, stripped-down techno that masters the art of less is more, delivering subtle sonic shifts of synths, cymbals and kicks for hypnotic perfection. Want a test of detail, timing and dynamic control? You’re in luck.